I read Pres. U's article and, I think came away with a different understanding. He was quick to point out where we have everything at our finger tips and yet are still unhappy. I think his message was that we should serve and love others and maybe that will help us to get out of ourselves. A message that I think Christ would agree with. You'll notice I didn't take any issue with his message. I just think the title is unfortunate, and even more so for those who will read the title, but never read the message, then make assumptions about what is implied by "All is Well." My goodness. You can't make this stuff up. President Uchtdorf offers an excellent essay encouraging us to choose compassion, work and optimism like our pioneer ancestors did—saddled with a mis-matched, rah-rah title. Given the instances in scripture warning us against self-satisfaction it's an odd combination. Never mind that the pioneers found themselves where they did as a result of failing to build the temple and thus suffering the promised wrath of God. I knew I had read this talk before. It is actually recycled from an address he gave in July 2013. Phew. So glad to know that all is as well now as it was then. You lose credibility when you imply condemnation of Pres. 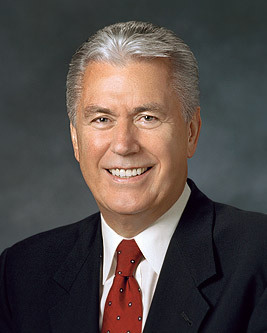 Uchtdorf by quoting scripture which uses the phrase "All is Well" in a completely different context than he does. Are you really concerned for people who read the title and assume they know what he means without reading the article? More likely people will give your article a cursory glance and assume Pres. Uchtdorf is leading the members of the church carefully down to hell. I have learned a lot reading your blog and like a lot of what you have written but I think this one is a cheap shot. I think it’s worth noting President Uchtdorf quoted the title from the Pioneer anthem, “Come, Come ye Saints.” If you pay attention to the hymn, it has a couple of meanings. Therefore, singing “All is Well” was either an act of boundless optimism in the face of terrible difficulty or it was an act of supreme denial, even dishonesty, given the wrath of God, which allowed them to be driven from Nauvoo. (See my post, Prophets, Part 6: Another Prophet Now is Sent.) Either way, all was certainly not well, even as they heroically struggled on. Uchtdorf said: “Despite evidence to the contrary, they sang with all the conviction of their souls, “All is well!”” He agrees, they denied the evidence before them and did exactly what Nephi warned us not to do. I appreciate the Pioneers and all their sacrifice so I could be taught Christ’s gospel. I don’t fault them for erring, because I certainly err. But the fact remains, the Nauvoo exodus was the result of profound failure to receive what God offered, and God’s resulting rejection. In the face of such difficulties as they faced, the Pioneers made the best they could of the situation, and their example is instructive, as President Uchtdorf has well noted. I take no issue with that. So we’re left to ponder the title of the article. I think Elder Uchtdorf’s selection of title, and focus on the song of denial could have two meanings. Either, it draws attention to the fact that, just like the Pioneers, and despite our denials, we find ourselves in a desperate situation wherein all is not well, or it encourages us to deny what is clearly evident and pretend that all is well and we can’t possibly be led astray. Is this a clarion call to repentance for those with ears to hear? Or is it an affirmation that nothing is wrong? What do we take from the title, and its source? What do we learn from Uchtdorf's bold stand? Either way, the Book of Mormon scripture is supremely applicable. And either way, Elder Uchtdorf has Chutzpah to even use such a title, regardless of which meaning he intended. And yes, I fear that, given the constant stream of positive platitudes we’re handed by LDS leadership, many will read the title and make assumptions without reading or pondering the article. This was not meant as a cheap shot. It was meant to cause reflection, for those with eyes to see. "All is Well" is one of the most toxic phrases in scripture, and yet it's the ending refrain of a favorite LDS hymn. President Uchtdorf is no fool; this was wittingly done. And that takes chutzpah. A well reasoned response and helps me better understand what you intended. I was unkind in my original comment and should have worded it more gently and apologize for that and am grateful for your generous response. Given my own shortcomings I have a hard time condemning the pioneers knowing that I fall far short of what I am offered. I see the hymn's refrain of All is Well as a condensation of "Search diligently, pray always, and be believing, and all things shall work together for your good if ye walk uprightly and remember the covenant wherewith ye have covenanted one with another." Not a statement of how things are but a declaration of faith and one that is entirely conditional on righteousness. Even so, as you say Pres. Uchtdorf chose to highlight a phrase that is negative in the scriptures and it is an unfortunate choice though I doubt he thought about it in the terms you suggest. As Socrates said, poets like seers and prophets say many fine things that they themselves do not understand. It is very sad to me that an educated man and one who is well spoken, feels the need to misdirect and use false interpretations to get his point across. That is not of God . The definition of "Chutzpah" is Denver Snuffer! In many passages in the scriptures, the Lord teaches us that we should seek His face. So that part is true. What is false is the idea that any man or woman, in our fallen state, all of whom have sinned, and therefore fall short of God's perfect standard, to re-enter the presence of the Father on our merits, are somehow ENTITLED to see God the Father and the Son is PATENTLY RIDICULOUS. The idea that God the Father and His Son can be conjured across the veil, because of ANY set of actions we take, is FALSE DOCTRINE. A manifestation of the Second Comforter, which is an appearance of the Lord Jesus Christ, is a gift from God. It is NOT a wage. It is NOT something we can earn. Anymore than salvation is something we can earn or are owed. Gifts are NOT entitlements. And they CANNOT be mandated, dictated or conjured – through ANY set of actions. The devil, on the other hand, CAN be conjured (Moses 5:23-30). And the devil can appear as an angel of light (D&C 128:20). It further appears that as we draw closer to the end of the Telestial world, the devil has become so brazen as to appear as the Savior Jesus Christ – to many who feel ENTITLED or have some set of EXPECTATIONS to see the Savior. The Savior is NOT subject to the 'commands' of men (Moses 5:30). Nor do we 'rule' over Him (Moses 5:23). Yet, in their prideful arrogance, in their expectant petitions to receive the Second Comforter, that is EXACTLY what they think they are owed. But what they are doing is inviting the devil and His minions to appear as 'angel(s) of light' or even as the Savior of the world – as we draw closer to the millennium. 1. Denver has uniformly encouraged people to remain in whatever church they belong to. To say that he has drawn away from the church thousands or tens of thousands of saints is misleading hyperbole. 2. He has never taught that anyone can demand or “conjure” the Second Comforter as a right. “It is a mercy to be received, not a goal to be achieved.” (Denver’s Quote) Has it occurred to you that the Lord is FAR more anxious to come to us than we are to receive Him? HE is the one who stands at the door and knocks, hoping we will open. (Rev. 3:20) HE is the one who rejoices that He can redeem us. 3. Denver has taught nothing about any “set of actions” that can force the Lord to come to you. 5. I would invite you to scripturally support your assertion that the devil can appear as the Savior, particularly given the fact that when the Lord redeems anybody, He has a resurrected physical body with wounded hands, feet, wrist, and side which are offered as physical proof of his identity (3 Nephi 11:14). That is not something the Devil can imitate because he has no physical body. I would invite you to let go of you pre-conceived notions that have not brought you redemption, become as a little child, open yourself to truth, and consider yourself a fool before God. This is the only way to hear His voice. Denver's message is indeed from the Lord, and has much to teach those who want to know their Redeemer. But the pack of falsehoods you've asserted above did not come from Denver Snuffer or the Lord. Another one of Snuffer's ideas that I consider "Chutzpah"! Search the scriptures for a definition of the “fulness of the priesthood.” I started that search in 1989. The answer, as far as I have been given it, took over 20 years to receive. It is highly presumptuous for us to assume we even know what that means. Also, try to put together a good definition of “keys” from the scriptures, and for bonus points, a list of keys held by the church or the president of the church. Since these are two topics about which we are given very little information in scripture, perhaps we ought to be a bit more reticent about claiming we know all about them. Now, regarding Joseph Smith receiving the priesthood, you point out we don’t have any record of Joseph receiving the priesthood from God himself. True enough (though an argument can be made for the voice of God in D&C 128:21). But, on the other hand, we do know Joseph was in the presence of God, and told us that much happened which he could not relate. So why assume it DIDN’T happen? Oliver Cowdery taught the same notion to the original twelve, stating that their ordination was incomplete until the Lord himself had laid his hand upon them. I think there’s more here than we might realize, and we ought to stop claiming we know all about it, and instead seek to learn what we don’t know. Hang on, let's read the scripture again: clearly it is referring to those who are lulled away into carnal security who use these words, those who are at ease who use these words. I am inclined neither to condemn the early pioneers nor Pres. Uchtdorf for using these words with a wholly difference intent and circumstance, for I fully trust that neither is in the aforementioned condition worthy of condemnation and woe when making this declaration whether in song or in the monthly message--anyway I am not about to accuse them of such. Pres Uchtdorf lays out the conditions under which we may indeed take comfort in the assurance, and these include work, optimism, and living the gospel valiantly in trials--none of which sound like the condition of a soul at ease or lulled into carnal security who had better not say all is well. If I bear testimony of God while living unrighteously i am no better than a devil, for they do the same. But if i live according to the words of the prophets I can indeed bear a true witness and say that all is well. Anonymous, I think you make a good point about the intent of the message. Even so, I would submit that all is not well as long as we are in this Telestial world, still struggling in our fallen, unredeemed state. Though we may indeed have hold of the rod of iron, most of us have not yet reached the tree and partaken of the fruit. There is yet a mist of darkness through which we all must pass. The wording is unique: "and thus the devil cheateth their souls, and leadeth them away carefully down to hell.” The misleading is done carefully, by whispering, and by flattery. It is aptly described as cheating. It is so subtle that those so misled are not likely to recognize it at all. They are “at ease” in forbidden paths. Even the humble followers of Christ are misled and err because of false teachings. Therefore, if we consider ourselves humble followers of Christ, we must deal with the fact that we are most likely struggling under a significant burden of false teachings (a.k.a. unbelief) that prevent us from exercising faith. Mormon 7:37 informs us how to recognize whether we struggle under a burden of unbelief. We can tell if we are truly “living according to the words of the prophets” by the miracles and angelic teachers that attend us on our walk. Absent these things, we are either following false prophets, or ignoring the teachings of the true ones. Let us never forget we are at war. No matter what we busy ourselves doing, all is NOT well. I really like your response because it rings true and helps me to be humble, even while l I remain confident in my witness of Him and in finding fault neither in President Uchtdorf nor the early saints for their use of the saying All is well. I believe we likewise can take comfort in the hymn while at the same time avoiding to be too comfortable. My experience is that miracles and angelic ministrations have not ceased. Yet we must remain vigilant to continually repent and try to do the works of the Master, while relying wholly on the merits of Him who is mighty to save.